El Roi. The God who sees. “The Angel of the Lord found her.” He FOUND Hagar… Friends, not only did He SEE her, as she so beautifully observed when she gave God one of the names by which we still call Him, El Roi, He was looking for Hagar, or you might say pursuing her. Just as God found Adam in the garden, He didn’t just happen upon her in the desert while on His way to do something else. He had seen her affliction, He had seen her fear and desolation, and He had gone after her and, like Adam in the garden, when He found her He asked her for her questions. When we read Genesis 3 we often shame our first parents for blame-shifting the responsibility for the events of the fall. While I’m not arguing that this is not a completely human thing to do, listen to how God responds. The LORD God said to the serpent, “Because you have done this…. and have eaten of the tree…. Wouldn’t you imagine that, had you just broken the brand new perfect world, you would hear the angry, thundering battle-ready stomps of God? As a parent I am certainly guilty of making my approach seem a little more dramatic when my child is in the wrong. But here we see God walking in His garden in the cool of the day. And we hear Him honoring His image in them as reasonable beings by asking them a question, rather than, being omniscient and knowing their wicked hearts, and immediately smiting them. He asked Adam, Eve… Hagar questions and did not shame them for their honest responses. Furthermore, we don’t hear Him mocking their answers as we so often do ourselves when we hear them blame-shifting. He listens to them without mocking their words and acts accordingly, in both judgment and mercy. There are consequences for all three of the guilty parties in the garden, for all of us, for the earth itself, for their individual roles in the breaking of His beautiful creation. While God holds Adam especially accountable because of his primary responsibility, He listens to their reasoning and deals not only with them directly, but also with the one who immediately aided and abetted them. Friends, do you hear the compassion and mercy in that? He’s obviously not saying that because another person was involved, the person being questioned has no fault at all, but He does not even question the veracity of the claims of shared responsibility. God knows. He sees the affliction of His children. He saw the affliction of Hagar, and He blessed her with a child. The blessing didn’t come without consequences and more hardships and sadness down the road, but God did not leave her. He sought her. He saw her. He listened to her. He didn’t shame her for running away. He pursued her because He acknowledged her suffering, and He also told her how He was going to provide for her. I’m sure Sarai would have loved for Hagar to stay away, but God would not allow Sarai off the hook. He was about to bless Sarai with a miracle baby but He would not permit her to drive the victim of her abuse away, never to be seen or heard from again. God knows. He sees you, friend. While our actions have consequences, God is determined to bless His creatures. Friends, this is why Isaiah 28:21 refers to His judgment as “His strange work, His alien work.” And it goes on to say, “Grain must be ground to make bread; so one does not go on threshing it forever. “While there is pain in the preparation, the end result is blessing, and the blessing is not His “strange work.” It’s His favorite work. Friends, El Roi, our Jesus, sees. He knows your affliction. He knows you have been wounded. He will not leave the guilty unpunished, nor will He leave any of His own dear children undisciplined. In Hagar’s case, God saw her affliction and provided for her by having her return to a place where it was exceedingly difficult to live. Likewise, when God saw the affliction of the Israelites in Egypt, He worked to set them free from their abusers and promised to bring them to their own land. But they didn’t get there without further trials, such hard trials that they frequently requested to be returned to their harsh masters. 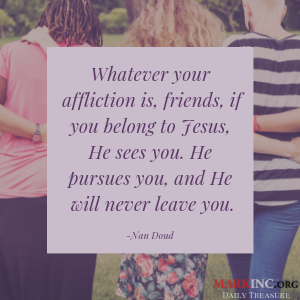 Whatever your affliction is, friends, if you belong to Jesus, He sees you. He pursues you, and He will never leave you. He may call you to further refining, which very often comes by way of suffering, but He will absolutely not leave you or forsake you. Don’t imagine like Hagar that your affliction will define you or determine your future. We have a God who sees you and who delights in blessing you. Precious Heavenly Father, thank you for the promise that if we belong to You, You see us. When we become overwhelmed and we want to run away, that You pursue us. When we feel alone, thank you for the promise that You will never leave us. Help us to be faithful with today, trusting that your grace is sufficient.